Rinse and cook quinoa according to package directions. If there is any water left in pot after cooking, drain. Place quinoa in serving bowl to cool. Meanwhile, drain pears reserving 2 tbsp juice for dressing. Slice pears into thin wedges. Pat dry. 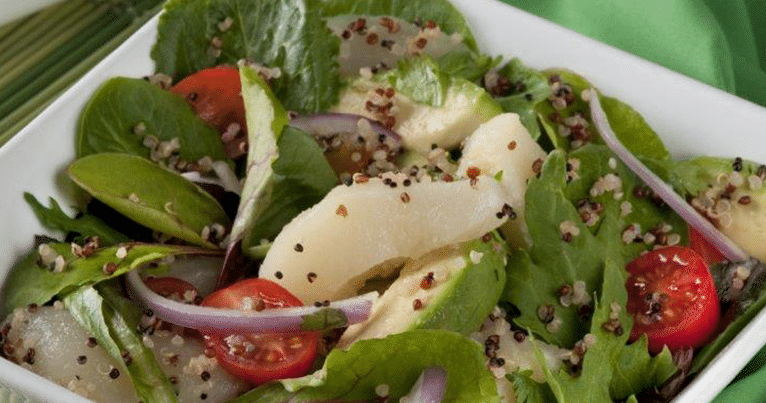 Once quinoa has cooled add pears, tomatoes, avocado, onion and greens to bowl. Gently toss. Whisk pear juice with lime juice, cumin, cayenne, garlic, salt and oil. Toss with salad and cilantro. Taste and add salt or lime juice if needed.